Brandt Snedeker became only the ninth golfer in US PGA Tour history to fire a 59 on Thursday, his 11-under effort putting him in the lead in the first round of the Wyndham Championship. Snedeker rolled in a 20-foot birdie putt at his final hole, the par-4 ninth, to join one of golf's most exclusive clubs. "To roll that putt in was such a cool feeling," said Snedeker, whose 10 birdies, six pars and one eagle virtually erased any memory of an opening bogey at the 10th hole. 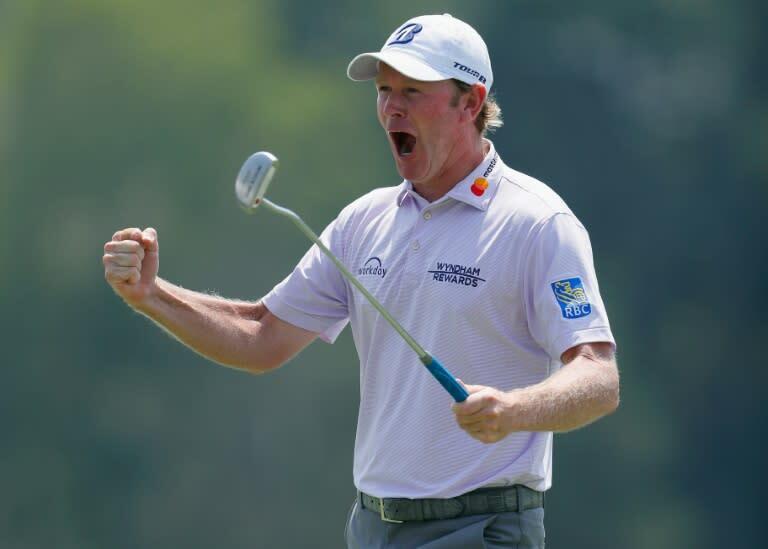 "I got so excited, goosebumps ... jumping around like I won the golf tournament and it's Thursday morning," Snedeker said. "I'll have to get the emotions in check this afternoon, get back to reality." Snedeker finished with 10 birdies, six pars and an eagle at Sedgefield Country Club in Greensboro, North Carolina. He improved on his career best of 61 -- which he has shot three times on tour -- and came up one shot shy of Jim Furyk's record low of 58 for a single PGA Tour round, achieved at the 2016 Travelers Championship. The 37-year-old American, whose most recent of eight PGA triumphs came in 2016 at Torrey Pines, made an inauspicious start when he went way left off the 10th tee beyond a cart path on his way to an opening bogey. Snedeker turned things around with 26-foot birdie putts at the par-4 13th and 14th holes, missed a 30-foot eagle putt at the par-5 15th but tapped in for birdie, then completed a run of four consecutive birdies with a 14-foot putt at the par-3 16th. He ran off three birdies in a row after making the turn, all from within 5 1/2 feet, and sandwiched two more short birdie putts at the par-5 fifth and par-3 seventh around his greatest shot of them all: a hole out from 176 yards out in the fairway for eagle at the sixth. "After I birdied seven, my 16th hole of the day, I knew I was 10 (under) with two to play," he said. "I had two great birdie opportunities, two short par-fours with wedges in your hand, so I told myself 'I'm going to do it. I'm going to shoot 59.'" But at the par-4 eighth, Snedeker missed a six-foot birdie putt and tapped in for par. "Walking to the ninth tee I kept telling myself "I cannot let this opportunity get out of my hands," he said, and he didn't. "To step up and have a 20-footer (at the final hole) and know what it means, when I knocked that putt in it was really special to know that I'm part of a small club on tour," he said. In the clubhouse, the epic run gave him a five-stroke lead over US compatriots D.A. Points, Brett Stegmaier and Martin Flores. The 59 broke the course and tournament record of 60 set in 2016 by South Korea's Kim Si-woo. Snedeker also fired the first sub-60 round to open with a bogey. It was the US PGA's first 59 since Canada's Adam Hadwin at last year's Careerbuilder Challenge. Other 59s were fired by Al Geiberger in 1977, Chip Beck in 1991, David Duval in 1999, Paul Goydos in 2010, Australian Stuart Appleby in 2010, Furyk in 2013 and Justin Thomas in 2017.